I have been enjoying this uncharacteristically cooler summer. My window air conditioning unit is still sitting on the shelf in the closet, and with just two weeks of August left, I’m expecting it to stay there. After over a dozen summers in this city, however, my memories of July and August heatwaves are filled with meals consisting solely of chilled food, sitting with my feet in a bathtub of ice water, and planning my leisure time with the single intent to escape – or at least momentarily distract myself from – the heat. New Yorkers have long shared this summer sentiment, as documented by materials in our Ephemera Collections, which will take us on a tour of how residents of this city beat the heat before air conditioning was a readily available option. They had sandwiches for lunch and a bottle filled with punch, ca. 1915, in the Postcard Collection. Museum of the City of New York. X2011.34.556. With all of the city’s many amazing parks, who doesn’t love a summer picnic? Breakfast, lunch, dinner – any meal is more enjoyable eaten outdoors than in a stuffy apartment, especially when accompanied by punch, as shown in the postcard above. Employers recognized the benefit of giving their employees a break from sweltering offices for a while, as well. The James D. Whitmore & Company certainly steps up the game a bit for their staff picnic with this engraved program, below. The event was held at “New Washington Park,” between 69th and 70th Streets at the East River – a space now occupied by New York Presbyterian Hospital. Fifth Annual Afternoon and Evening Picnic, Employees of James D. Whitmore Co., 1881 (exterior and interior views), in the Collection on Social Events. Museum of the City of New York. 95.87.46. 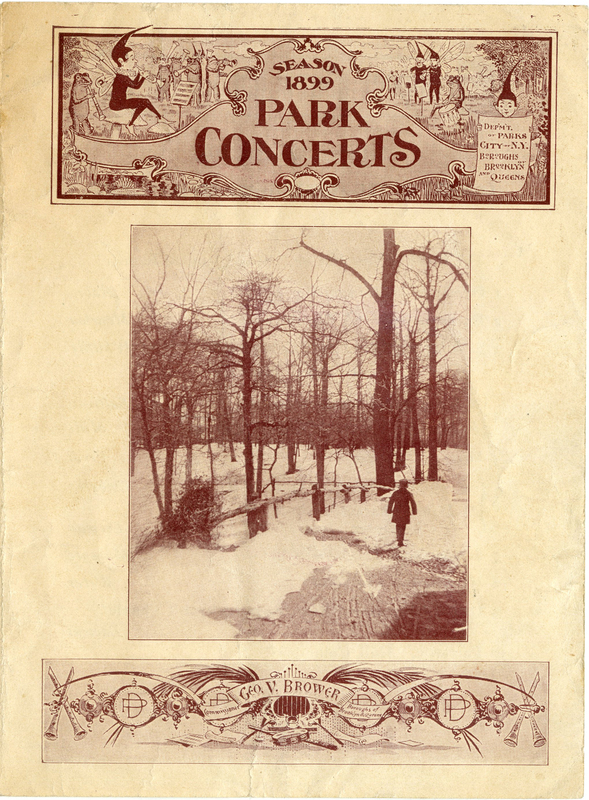 Park Concerts, Season 1899, in the Collection on Culture and Entertainment. Museum of the City of New York. F2011.101.18. The city also offers a wide range of outdoor entertainment options, some of which we touched upon earlier this summer in Morgen’s post “Up on the roof, entertainment in plein air.” With organizations such as SummerStage and Celebrate Brooklyn, two of many performing arts series that bring cultural events to parks and other public spaces in the city, New Yorkers have a wide variety of options for outdoor entertainment, many of which are free. 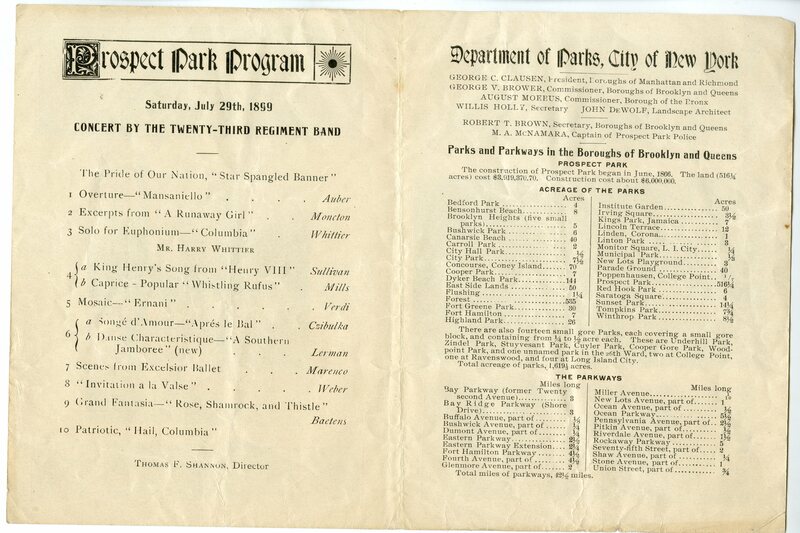 The program to the left features the musical lineup for a concert at Prospect Park, July 29, 1899. Click here to view the interior of the program. Some entertainments offered a way to beat the heat indoors, as depicted in this advertisement below for the grand re-opening of the Manhattan Roller Skating Rink, featuring a “patent cooling apparatus” and ice cream. 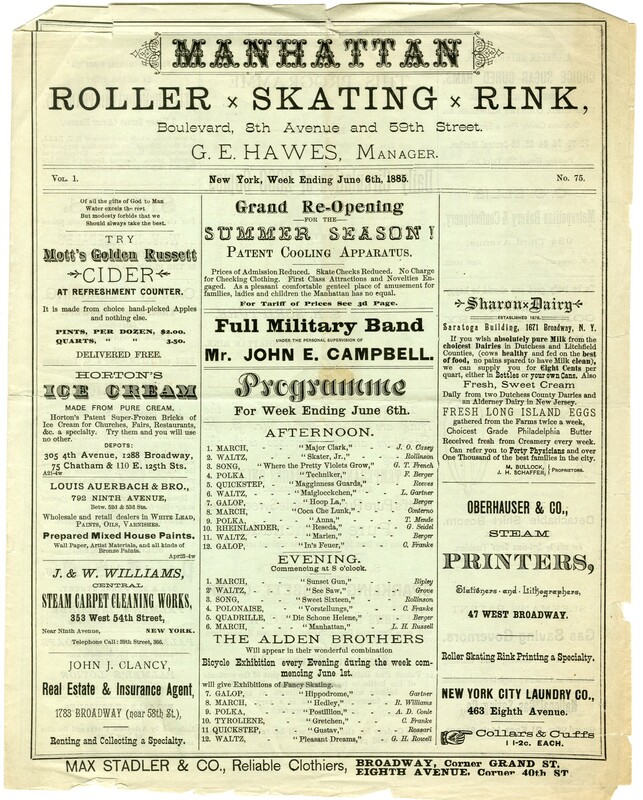 Manhattan Roller Skating Rink, 1885, in the Collection on Culture and Entertainment. Museum of the City of New York. 39.240.939. Of course, one way to beat the heat is simply to get out of town. These days, popular culture loves to characterize the New York summer by the flight of many of its residents to “the Hamptons,” but excursions to seaside locations have long been a tradition for New Yorkers. 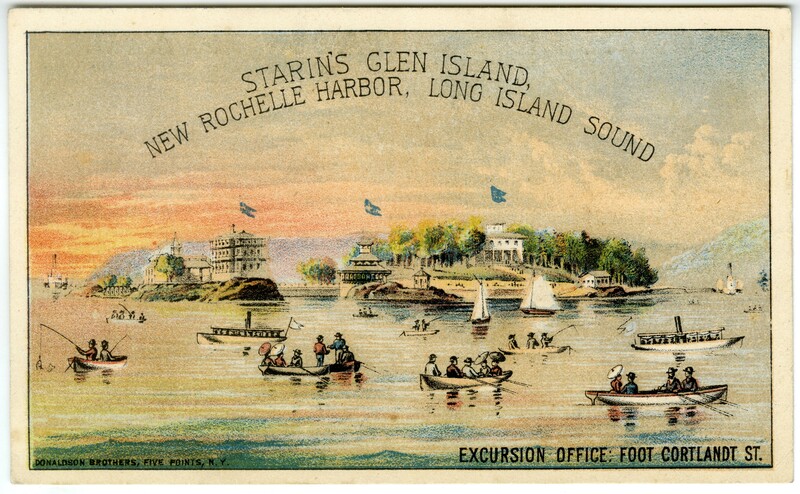 U. S. Congressman John H. Starin purchased Glen Island and several nearby islands in 1879 in Long Island Sound, just north of the Bronx’s Pelham Bay Park, converting them into a summer resort that is often referred to as the first theme park. The island is now owned and operated by Westchester County, though it is also home to a privately operated entertainment facility. 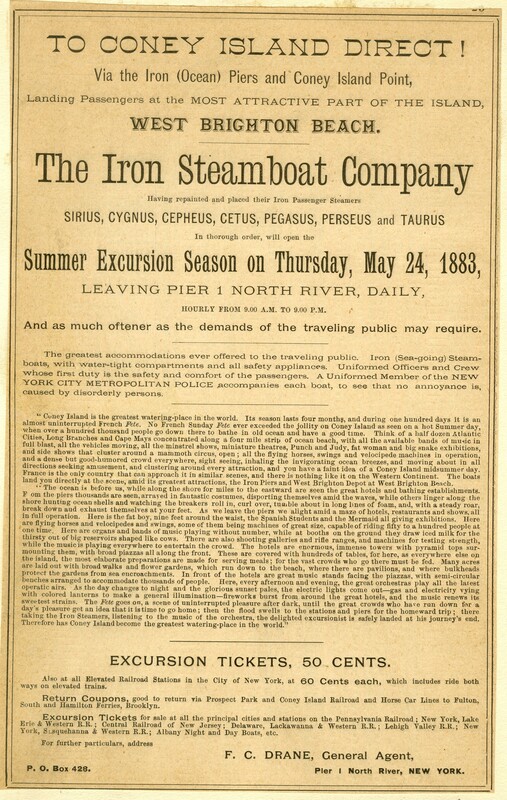 Iron Steamboat Company, 1883, in the Collection on City Infrastructure. Museum of the City of New York. 54.252.2. While ferries ran daily to resorts such as Starin’s, where one would stay for several days at a time, the city was also full of companies that ran day drips to various beaches such as Coney Island and Brighton Beach, still popular destinations today. 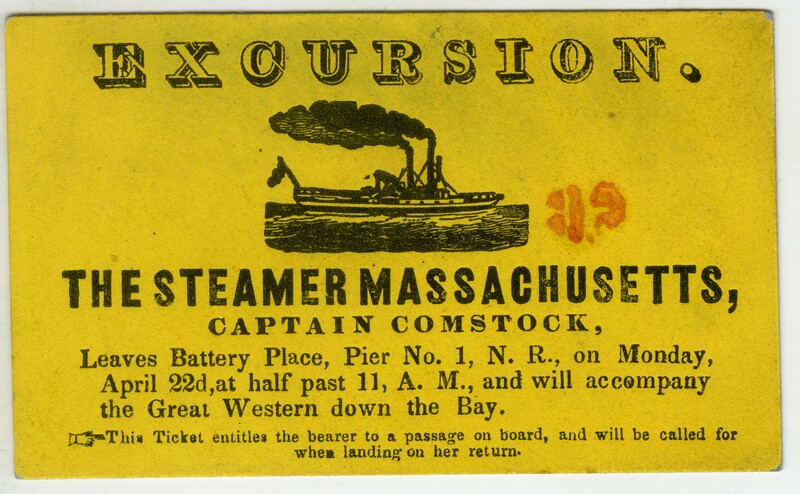 Some companies offered boat excursions simply for the sake of getting a fresh breeze out on the water, such as this one on the Steamer Massachusetts. Manhattan Beach, another popular summer bathing destination, was accessible by a number of combinations of rail, trolley, and ferry. 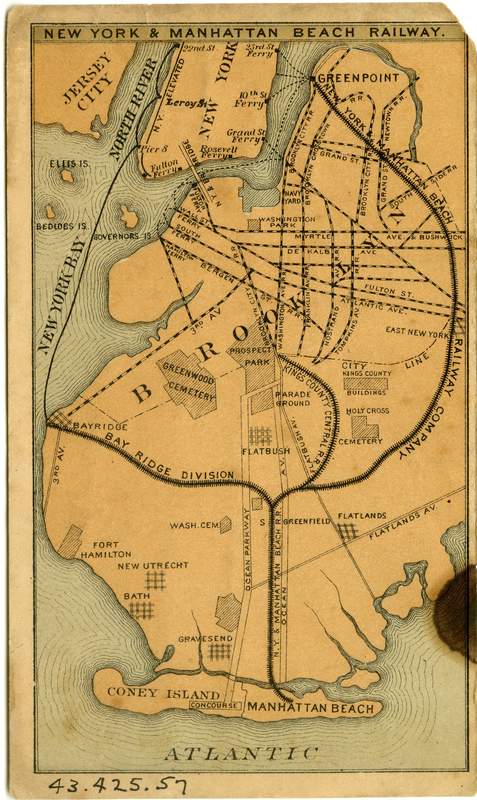 New York & Manhattan Beach Railway, 1878, in the Collection on City Infrastructure. Museum of the City of New York. 43.425.57. You can see more images of New Yorkers picnicking, enjoying outdoor entertainment, and taking advantage of the city’s beaches on the Collections Portal, but don’t live vicariously through history – get out and enjoy the last bit of summer yourself! High resolution images of these selections, and many more, will soon be available via the Museum’s online Collections Portal, thanks to the generous support of the National Endowment for the Humanities (NEH). This entry was posted on August 19, 2014 by Lindsay Turley in Digital Project, Manuscripts and Ephemera and tagged Beaches, boats, Entertainment, Ephemera, Excursions, ferries, Heat, Music, National Endowment for the Humanities, parks, Picnics, Summer.